Burnley boss Sean Dyche always knew that he had a future England international on his hands in defender Kieran Trippier. January's Manager of the Month nominee alerted the head honchos at the Football Association to the right back's potential when succeeding Eddie Howe in October 2012. Trippier had made 65 appearances for the Clarets when first acquainted with Dyche, he had been voted the club's Player of the Year just months earlier, and it was clear that the one-time Manchester City youngster had the capacity to go much further. However, it wasn't until around six-and-a-half years later, at the World Cup in Russia, that the 28-year-old made an impression on the international stage for the Three Lions. 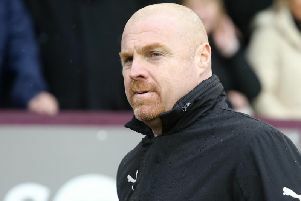 "I mentioned it years ago when I had him and we were in the Championship," said Dyche. "I said to the powers that be at the FA that you should be monitoring this lad. "I had great belief in his ability and I thought his defensive understanding was improving and I thought it would improve working with me and my staff here and the team which it did. "Football is about opinions, I can only have mine and I can’t guarantee it rubs off on everyone else’s. "I am pleased for him because when he first went to Tottenham it was a bit up and down and he was in and out and it was difficult for him but he has stuck at it and continues to get his rewards for what he does. "He was a valuable part of us and he is becoming a more and more valuable part of Tottenham. I know they have other options but he is more and more an increasing part of them and also on the international scene so all credit to him." Dyche didn't have a bad word to say about Trippier ahead of his return to Turf Moor on Saturday. The Clarets chief confirmed that there were some minor teething problems at the beginning of his tenure but he had a model professional in his midst once they were ironed out. Burnley secure automatic promotion from the Championship in the 2013/14 campaign. And Dyche used a dictionary's worth of superlatives to describe his pride in Trippier's career trajectory since his move to the capital. "From where he was to where he is I think he left on the right pathway and I think that is enhanced by playing with a different set of players and a different manager and a continued pathway that he was on already. "I have always said he was a top player. I was amazed it took so long for him to be playing regularly at Tottenham but every manager will have their own reasons for that. "But only because of what I saw here everyday, his ability is outstanding, his technical ability. I enjoyed being around him, I enjoyed him being in our camp, I enjoyed his performances in training, his desire was improving all the time, his professionalism was improving all the time. "The understanding of the profession not just the game and that has continued to grow into a real all-rounder and a very good professional. Apart from Saturday we want that to continue. "He stood out for different reasons [at first], we helped him realign that side of his profession. "I just love the kid, his character, his manner, his inner-drive and determination. He wouldn’t really shout the odds about it but the way he trained and went away about it. There is a lot to like about Kieran.